At Beech Hill School, we are committed to supporting the emotional health and wellbeing of our pupils and staff. We know that everyone experiences life challenges that can make us vulnerable and at times, anyone may need additional emotional support. We take the view that positive mental health is everybody’s business and that we all have a role to play. 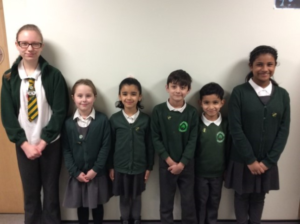 The children above have been selected to represent their year group as ‘Mental Health Councillors’. They have been hand selected to act as a voice for their year group. They will begin to attend regular meetings with both Mrs Moxon and Mr Hoyle to discuss any current problems, or ideas to promote positive mental health. The group has been set up to promote mental health, and for both children and staff to begin discussing about the topic. Half termly assemblies will begin to be delivered to all pupils in school to discuss how to cope with different feelings, problems and issues. They will understand that it is fine to have lots of different feelings and they will know that they can talk to their Mental health Councillor, Learning Mentors or any other member of staff. The children will then learn about different coping strategies if their feelings become too strong. The Mental Health Councillors role is important and is valued throughout the school.